Engraving of the sculpture of Shakespeare at the entrance to the Boydell Shakespeare Gallery. The sculpture is now in the former garden of Shakespeare's home New Place in Stratford. Bardolatry is the worship, particularly when considered excessive, of William Shakespeare. Shakespeare has been known as "the Bard" since the nineteenth century. One who idolizes Shakespeare is known as a Bardolator. The term Bardolatry, derived from Shakespeare's sobriquet "the Bard of Avon" and the Greek word latria "worship" (as in idolatry, worship of idols), was coined by George Bernard Shaw in the preface to his collection Three Plays for Puritans published in 1901. Shaw professed to dislike Shakespeare as a thinker and philosopher because the latter did not engage with social problems, as did Shaw in his own plays. The earliest references to the idolising of Shakespeare occur in an anonymous play The Return from Parnassus, written during the poet's lifetime. A poetry-loving character says he will obtain a picture of Shakespeare for his study and that "I'll worship sweet Mr Shakespeare and to honour him will lay his Venus and Adonis under my pillow, as we read of one – I do not well remember his name, but I'm sure he was a king – slept with Homer under his bed's head". However, this character is being satirised as a foolish lover of sensuous rather than serious literature. The serious stance of Bardolatry has its origins in the mid-18th century, when Samuel Johnson referred to Shakespeare's work as "a map of life". In 1769 the actor David Garrick, unveiling a statue of Shakespeare in Stratford-upon-Avon during the Shakespeare Jubilee, read out a poem culminating with the words "'tis he, 'tis he, / The God of our idolatry". Garrick also constructed a temple to Shakespeare at his home in Hampton. The phenomenon developed during the Romantic era, when Samuel Taylor Coleridge, John Keats, William Hazlitt, and others all described Shakespeare as a transcendent genius. 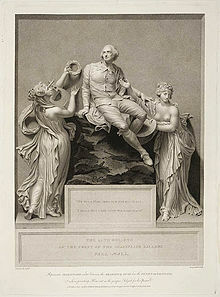 Shaw's distaste for this attitude to Shakespeare is anticipated by William Cowper's attack on Garrick's whole festival as blasphemous in his poem The Task (1785). Thomas Nast, study for The Immortal Light of Genius, 1895. The phenomenon became important in the Victorian era when many writers treated Shakespeare's works as a secular equivalent or replacement to the Bible. "That King Shakespeare," the essayist Thomas Carlyle wrote in 1840, "does not he shine, in crowned sovereignty, over us all, as the noblest, gentlest, yet strongest of rallying signs; indestructible". Of this Shakspeare of ours, perhaps the opinion one sometimes hears a little idolatrously expressed is, in fact, the right one; I think the best judgment not of this country only, but of Europe at large, is slowly pointing to the conclusion, that Shakspeare is the chief of all Poets hitherto; the greatest intellect who, in our recorded world, has left record of himself in the way of Literature. On the whole, I know not such a power of vision, such a faculty of thought, if we take all the characters of it, in any other man. Such a calmness of depth; placid joyous strength; all things imaged in that great soul of his so true and clear, as in a tranquil unfathomable sea! Shaw's sceptical views arose in response to such ideas. Shaw wished to demythologise Shakespeare. He emphasised that Shakespeare was capable of both brilliance and banality, a point made humorously in his late puppet play Shakes versus Shav, in which he compares Shakespeare's work to his own. He unequivocally asserted that Shakespeare was a great poet, even calling him "a very great author" at one point, and praised his use of what Shaw called "word-music". He also declared, "Nobody will ever write a better tragedy than Lear". However, he also wrote in a letter to Mrs Patrick Campbell, "Oh, what a damned fool Shakespeare was! ", and complained of his "monstrous rhetorical fustian, his unbearable platitudes, his sententious combination of ready reflections with complete intellectual sterility". 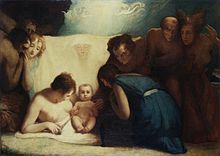 The critic Harold Bloom revived bardolatry in his 1998 book Shakespeare: The Invention of the Human, in which Bloom provides an analysis of each of Shakespeare's thirty-eight plays, "twenty-four of which are masterpieces." Written as a companion to the general reader and theatergoer, Bloom's book argues that bardolatry "ought to be even more a secular religion than it already is." He contends in the work that Shakespeare "invented" humanity, in that he prescribed the now-common practice of "overhearing" ourselves, which drives our own internal psychological development. In addition, he embraces the notion of the true reality of the characters of Shakespeare, regarding them as "real people" in the sense that they have altered the consciousness and modes of perception of not only readers, but most people in any western literate culture. ^ "Bardolatry". OED Online. Oxford University Press. Retrieved 28 October 2012. ^ "bardolatry". thefreedictionary.com. Retrieved 22 December 2007. ^ Tallent Lenker, Lagretta (30 April 2001). Fathers and Daughters in Shakespeare and Shaw (Contributions in Drama & Theatre Studies). Connecticut: Greenwood Press. p. 5. ISBN 0-313-31754-2. ^ The Return from Parnassus, Act 4, scene 1. ^ "A Playwright for the Ages". Royal Shakespeare Company Michigan Residency 2006. University of Michigan. 2006. Archived from the original on 17 December 2007. Retrieved 21 December 2007. ^ Michael Dobson, The Making of the National Poet: Shakespeare, Adaptation and Authorship, 1660–1769, Oxford University Press, 1992, p.6. ^ Levin, H (Spring 1975). "The Primacy of Shakespeare". Shakespeare Quarterly. Johns Hopkins University, Baltimore: Johns Hopkins University Press. 26 (2): 99–112. doi:10.2307/2869240. JSTOR 2869240. Retrieved 21 December 2007. ^ "The Project Gutenberg eBook of Tolstoy on Shakespeare, by Leo Tolstoy". Gutenberg.org. 2009-01-07. Retrieved 2014-03-19. ^ Webster, Margaret, Shakespeare Without Tears, Dover Publications, 2000 [originally published 1942], pp. 25–6. Laporte, Charles. "The Bard, the Bible, and the Victorian Shakespeare Question." English Literary History. Vol. 74, No. 3, Fall 2007: 609–628. Laporte, Charles. "The Devotional Texts of Victorian Bardolatry." Shakespeare, the Bible, and the History of the Material Book: Contested Scriptures. Eds. Travis DeCook and Alan Galey. Routledge. 2012: 143–159. This page was last modified on 5 November 2016, at 19:28.